A total now of 49 people have been killed – work is under way to confirm their identities as quickly as possible. 41 people died at Deans Avenue Mosque, 7 at the Linwood Avenue Mosque – and 1 person has since died in hospital. Over 40 people are being treated for injuries at Christchurch hospital – they have all been identified and those names have been shared with members of the community. Two of those are in critical condition and this includes a 5-year-old child who has been transported today to Starship Hospital in Auckland. Three people have been arrested in relation to this event. One Australian citizen will appear in court today charged with murder. This individual has travelled around the world with sporadic periods of time spent in New Zealand. They were not a resident of Christchurch. In fact they were currently based in Dunedin. Enquires are ongoing to establish whether the other two were directly involved with this incident. The fourth person who was arrested yesterday was a member of the public who was in possession of a firearm, but with the intention of assisting police. They have since been released. None of those apprehended had a criminal history either here, or in Australia. As I said last night, they were not on any watch lists either here, or in Australia. I want to be very clear that our intelligence community and police are focused on extremism of every kind. Given global indicators around far right extremism, our intelligence community has been stepping up their investigations in this area. The individual charged with murder had not come to the attention of the intelligence community nor the police for extremism. I have asked our agencies this morning to work swiftly on assessing whether there was any activity on social media or otherwise that should have triggered a response. That work is already under way. I’m advised that there were five guns used by the primary perpetrator. There were two semi-automatic weapons, and two shotguns. The offender was in possession of a gun licence. I’m advised that this was acquired of November 2017. A lever action firearm was also found. While work is being done as to the chain of events that led to both the holding of this gun licence, and the possession of these weapons, I can tell you one thing right now. Our gun laws will change. There have been attempts to change our laws in 2005, 2012 and after an inquiry in 2017. Too late for change in this case, and it will take time to work out what sort of changes will be made, but change looks inevitable. There are obviously questions being asked of how this person was able to enter the country and undertake this act of terror. I have instructed ODESC to report to Cabinet on Monday on this sequence of events with a view to strengthening our systems on a range of fronts including but not limited to, firearms, border controls, enhanced information sharing with Australia and any practical reinforcement of our watch list processes. The safety of New Zealanders is our highest priority. New Zealand Police remain on high alert. Christchurch residents are strongly urged to stay home if possible and stay safe. Please monitor the Police website and social media for further information. If you see something suspicious then call 111 immediately. A number of events are being held across the country today and there will be an increased Police presence. Police have additional patrols out on the streets of Christchurch to reassure the community. They have flown in 45 additional police staff to Christchurch with a further 80 staff arriving today. The additional police staffing includes public safety teams, detectives, tactical specialists and intelligence support. Staff from other DHBs have offered support as required. There will be additional support provided in Christchurch for mental health and psychosocial needs. Police are aware of distressing material relating to this event being online and are reminding people it is an offence to distribute objectionable material. Police immediately secured the areas involved and ensured that people were kept safe, including schools and offices being locked down. Police made arrests swiftly and a man will appear in court this morning. Defence specialists quickly moved to assist police to make the improvised explosive devices safe. I want to make special mention of those who are involved in parts of the operation involving disarming devices and undertaking the arrests themselves. Many of you may have seen the footage of the arrest and I can only describe it as an act of bravery on behalf of all New Zealanders and an act that showed very little regard for their own personal safety. I’m sure everyone in New Zealand wants to acknowledge the police and particularly the officer who made that arrest yesterday. I also want to acknowledge ambulance staff who many will have seen acting swiftly under horrific conditions and all medical staff who continue to work with those who are injured. NZ Defence Force at Burnham Camp yesterday were put on standby to assist police in Christchurch. Mosques around the country were provided with advice from police to help keep them secure and advised to remain closed. This advice continues as does the police presence at mosques around the country. The national threat level was raised to high, which triggers a number of actions to help keep people safe, such as increased aviation and border security. A number of specialist family liaison staff were deployed. Close liaison has been established with the Muslim community and other key people in Christchurch. MFAT are acting as a liaison point for foreign governments – consular representation for any foreign nations involved has been provided. At this stage I understand those involved include Pakistan, Turkey, Saudi Arabia, Bangladesh, Indonesia and Malaysia. MFAT staff are dealing with offers of assistance, and are receiving a significant number of condolence messages. Deputy Commissioner Maori and Ethnic Services Wally Haumaha has travelled to Christchurch, alongside 15 additional ethnic liaison officers to support the community. These specialists will work alongside local staff to support the families involved. They are assisting to repatriate them with their loved ones in a way that is consistent with Muslim beliefs, while taking into account these particular circumstances and obligations to the coroner. …that while the nation grapples with a form of grief and anger that we have not experienced before, we are seeking answers. After this media conference I will board a defence force plane and travel to Christchurch. I will have other political leaders with me including the Leader of the Opposition. As is the entire nation, we are all unified in grieving together. An 0800 number established to register missing persons – 0800 115019 – and a website, Restoring Family Links (RFL). Three alarming incidents in the past week in the US – the pipe bombs sent to a number of individuals and companies, two black people shot in a grocery store, and the Pittsburgh synagogue shooting – have raised concerns that hate crime is on the rise. President Donald Trump has inevitably been included in discussions in reaction to these incidents. It is difficult to judge how much Trump may have encouraged this sort of hate violence, but how he responds may make a difference – and while he has played lip service to outrage and condemnation, his actions continue to be troubling. This apparent rise in hate crimes, the tip of a large iceberg of online intolerance and hate, is happening on Trump’s watch. What is going on in this country? Can’t we be safe in our homes, in our schools, in our most sacred places? Once again, Americans are left to ask each other these sorts of questions, after a gunman burst into the Tree of Life Synagogue in Pittsburgh on the Jewish Sabbath and opened fire on families in the contemplation of their faith. The attack came a day after a man was arrested in Florida for mailing pipe bombs to politicians and journalists across the country. In both cases, the suspects had nourished their animus online, on social media platforms where they could easily connect with people who shared their hatreds. Alongside anti-Semitism, anti-black hatred appears to be rising. It has been expressed recently not only in incidents in which white Americans have harassed black Americans for gardening, coming home, swimming, working or campaigning for public office, but in deadly attacks like the one by a bigot who shot two black people at a Kentucky grocery last week, after he tried but failed to enter a black church. At least some of the hate behind attacks like this is fomented online. The suspect in the Pittsburgh killings, Robert Bowers, had found a home for his hate on Gab, a new social network that bills itself as a guardian of free speech, unlike somewhat less permissive platforms like Twitter. There his online biography read, “Jews are the children of Satan,” a statement of personal values that he evidently expected to earn him not opprobrium but followers. Mr. Bowers’s hatred of American Jews was apparently motivated in part by the generosity and empathy many of them have shown for non-Jewish refugees of conflicts worldwide. In their humanity, he found cause to dehumanize them. “It’s the filthy EVIL jews Bringing the Filthy EVIL Muslims into the Country! !” he wrote online. Gun laws come up again after mass shootings, but little ever seems to change. And guns are just tools of extreme merchants of hate, many of whom build their bravado online. What can be done? Certainly, common-sense gun safety regulation might make attacks like the one on Tree of Life synagogue less deadly— universal background checks, red-flag laws that take guns away from the mentally unstable, bans on high-capacity weapons like the AR-15 rifle that the alleged killer wielded. Measures like these would help contend with the hardware of hate. It is far harder to disable the software, the ideas that now spread so readily. It is difficult to confront online hate. Some of it ferments in protected bubbles. Leadership that is unequivocal about condemning intolerance and hate would help. Good speech may not be enough in itself, but that doesn’t mean that American society couldn’t benefit from much more of it today, particularly from its leaders. So it was reassuring to hear President Trump condemn the attack in Pittsburgh, as he did the pipe bombs. And it was disappointing to see him immediately head back out on the campaign trail, as he did on Saturday, to disparage his opponents and critics all over again. Until next week’s mid-term elections it seems that hate and division as tools of politics will continue. It isn’t simply a Trump issue, but as the leader and commander-in-chief of the country he must take some responsibility for the escalations and do more than speak out of both sides of his mouth. Predictably, the establishment is blaming President Trump and his supporters for a climate of rage and hate. But let’s be honest, a lot of Americans have had a lot to be angry about for an awful long time. This anger we’re seeing, it didn’t start with Donald Trump. I think it goes back at least a decade. In 2008 you saw the elite bail themselves out while working people paid the price for their recklessness and incompetence. And you saw a new tone enter our politics. Reagan, the Bushes, Bill Clinton, Bill Clinton perhaps a bit too much – they weren’t haters. You got the sense they loved everybody. But then we saw something new. A cultural elitism came in. Condescension. Even contempt. We saw hate and divisiveness — from the top. And remember, from the left, not the right. From the elitists, not the populists. What he claims is debatable (very much so) but there is one truth that can’t be denied – the current levels of division and hate are happening on Trump’s watch. There has been another mass shooting in the US, this time at a national video game tournament that was being live streamed. Two people have been murdered, and the gunman also killed himself. There was a mass shooting at a video game tournament that was being streamed online from a restaurant in Jacksonville, Florida, on Sunday, and the local sheriff’s office said there were multiple fatalities. The sheriff’s office said one suspect was dead at the scene and that it was unknown whether there was a second suspect. “Searches are being conducted,” the sheriff’s office said. The business was livestreaming a tournament for a Madden football video game when several shots rang out, according to video of the stream shared on social media. This will no doubt reignite debate over gun laws in the US, in a now familiar pattern of outrage, subsidence, another shooting, outrage and so on with nothing much changing. This particular attack is also likely to prompt further debate on the possible effects of gaming – which often involves shooting – on people’s attitudes to shooting people for fun, despite this tournament being focussed on football. There’s been a lot of the usual ‘thoughts and prayers’ offered after the Annapolis shooting, but they are little more than saying ‘hello’ or ‘goodbye’, well intentioned but meaningless. One Capital Gazette staff writer, Selene San Felice, put this into more meaningful words in a CNN interview today. Sadly, if this shooting is like last week’s shooting and last month’s shooting and all the other US mass shootings, after a few days of saying something must be done there will probably be nothing else that will change anything. Capital Gazette staff writer Phil Davis questioned society’s response to mass shootings. “If we’re going to have a position in our society where all we offer each other is prayers, then where are we? Where are we as a society, where people die and that’s the end of that story”. He said he heard the gunman shoot through a glass door on the first floor. Davis, a crime and courts reporter, said he wondered if they were all going to die when he heard the gunman reload. He said The Capital’s employees were just doing their jobs and had no motive to hate the gunman. “It makes you feel powerless. It makes you feel helpless. It removes all control from every facet of your life within only a few seconds once you understand what’s happening”. There were US wide protests and demands after a school shooting a while ago. Until the next shooting. Someone needs to show some leadership and make real change in the US. But I don’t see that happening. It’s easy to say ‘thoughts and prayers’. But the US needs something else. Another shooting in the US with reports of multiple being shot in the Capital Gazette, an Annapolis, Maryland newspaper office . A suspect was apprehended following reports of shots fired and multiple fatalities in Annapolis, Maryland, Thursday afternoon outside the Capital Gazette newsroom, Anne Arundel Sheriff Ron Bateman told Fox News. The Baltimore Sun, which owns the Annapolis newspaper, says a reporter told them of the shooting. This story is just unfolding. With his career now in decline, he’s taken to continuing with his inflammatory comments, including hoping for violence against any news outlet that bothers to call him. “I can’t wait for the vigilante squads to start gunning journalists down on sight,”. Another horrific mass shooting in the US, this time at a school in Florida. The Federal Bureau of Investigation was warned last year about an ominous online comment by the 19-year-old man accused of killing 17 people in his former high school but was unable to locate him, an agent said on Thursday. Authorities said the ex-student, identified as Nikolas Cruz, walked into the Marjory Stoneman Douglas High School in Parkland, near Miami, on Wednesday and opened fire with an AR-15-style assault rifle in the second-deadliest shooting at a public school in U.S. history. Cruz may have left warning signs on social media. A person with his name wrote a comment last year under a YouTube video that read “I‘m going to be a professional school shooter.” The man who posted the video, Ben Bennight, a Mississippi bail bondsman, was alarmed and contacted the FBI, according to a video he posted online late Wednesday. Wednesday’s shooting was the 18th in a U.S. school this year, according to gun control group Everytown for Gun Safety. It stirred the long-simmering U.S. debate on the right to bear arms, which are protected by the Second Amendment of the U.S. Constitution. The big question is, given the number of guns and the lax gun laws in the US – how? There is no obvious answer that the NRA lobby and politicians they fund are likely to accept. The death toll from shooting at a concert in Las Vegas is now 58, with hundreds injured. It is reported that a single gunman using at least 10 weapons fired on the crowd from the 32nd floor of a resort. Motive for the killing appears to be unknown at this stage. A gunman turned a Las Vegas concert into a killing field Sunday night from his perch on the 32nd floor of the Mandalay Bay Resort and Casino, using at least 10 guns to rain down a steady stream of fire, murdering at least 58 people and injuring more than 500 others in the deadliest mass shooting in modern United States history. The gunman, who fired down on the Route 91 Harvest Festival from a room on the 32nd floor of the Mandalay Bay Resort and Casino, died from a self-inflicted gunshot wound just as police made entry to the room, according to LVMPD undersheriff Kevin McMahill. 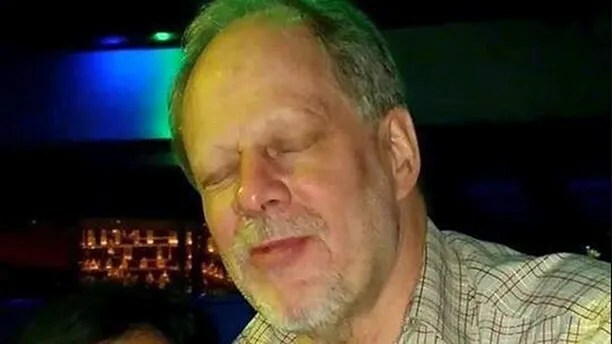 The suspect was identified as 64-year-old Stephen Paddock, a resident of Mesquite, Nevada. Federal law enforcement sources told Fox News that Paddock “was known to local authorities” in Vegas. Clark County Sheriff Joseph Lombardo said an “excess of 10 rifles” were found in the room, but did not immediately reveal a motive. Paddock had been in the hotel room since September 28, according to Lombardo. A horrible act in a country awash with firearms. The question inevitably asked is whether there are wider terrorist links. At this time, federal officials do not see any connection to international terrorism and little is known about Paddock’s motivation, sources said. The Islamic State terror group took credit for the Las Vegas shooting, saying the gunman converted to Islam months ago, but provided no evidence back up the claim. 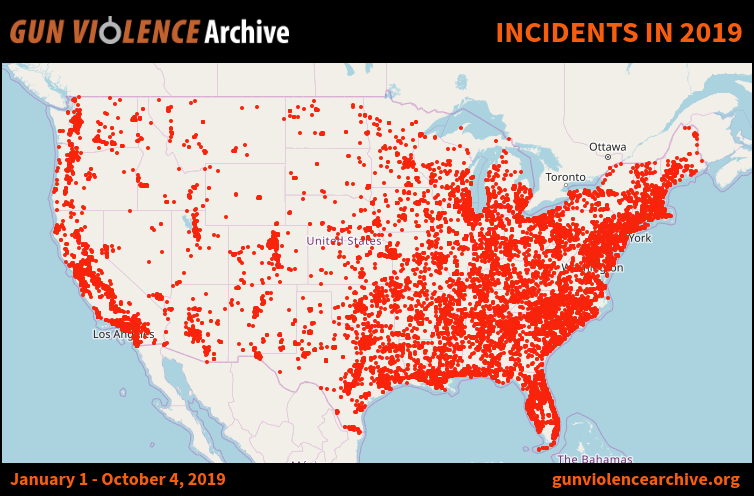 Gun violence and crime incidents are collected/validated from 2,500 sources daily – incidents and their source data are found at the gunviolencearchive.org website. In a new development in the Whangarei shooting, in which two female property inspectors were shot dead and a maintenance man injured, the police have revealed that they visited the property last month. Quinn Patterson killed property manager Wendy Campbell, 60, and her 37-year-old daughter Natanya on Wednesday morning when they visited his home with a contractor to install smoke alarms. The contractor was also shot, but managed to escape and raise the alarm. Northland District Commander Superintendent Russell Le Prou said police investigated a structure being built there last month, and were told it was to be used for target practice. Police decided it was a tenancy matter, rather than one for them. Police said the visit to the property formed part of the ongoing investigation into Patterson’s background. There have been reports that Patterson, aged in his 50s, had multiple guns and other weapons, including grenades and thousands of rounds of ammunition. People using firearms in rural areas is common. There can be many legitimate and innocent reasons for using them. I wouldn’t mind if police asked to see my firearms license just as a check. Perhaps if there are any checks on rural properties it should include a check of whether firearms are present and whether there are firearms licenses. The killing of two women and injuring of a man in Northland looks like a tragic and sad mix of mental illness and firearms. It was known that the murderer was a frequent user of firearms. It seems to have been known that he suffered from mental illness and depression, and he had a record of violence. He didn’t have a firearms license but had somehow acquired a lot of weapons. Police are refusing to discuss how a convicted criminal who shot two women was able to collect firearms without a licence. There are reports that Patterson, aged in his 50s, had multiple guns and other weapons, including grenades and thousands of rounds of ammunition. Police have confirmed he did not have a firearms licence. He served 18 months in prison for stabbing a police officer multiple times with a 33cm hunting knife in Hamilton in 1983. Patterson’s only sister, Gloria, says her brother’s mental and physical health deteriorated rapidly this year and she had urged him to seek help. Friend Leah Cameron said Quinn’s father brought his children up with a “Doomsday” mentality. “He was fatalistic about the world, that it was not a good place. He could have been classed as being a bit of a fanatic”. He made his children dig graves with him and he and his wife apparently wrote a book about UFOs. Patterson liked guns despite friends saying he did not have a licence and was not a hunter. Neighbours would often hear him shooting in his backyard. “He just shot in his back lawn by the sounds of it, you could hear it from here, you could hear it from everywhere,” Walters said. “They were big guns. we’re talking automatics, semi-automatics, big calibres. They sounded like cannons, you could hear them going off with, like, 16 rounds. He became paranoid and started to accumulate several weapons. A friend told Newshub he had grenades, shotguns, rifles and hand guns. He had “barricaded” himself in the property with bars on the windows. He was becoming more and more depressed and paranoid, friends said. He had taken several types of medication over the years, including sleeping tablets and had tried natural medication, vitamins and exercise in an attempt to get better. There are some obvious questions that need to be asked about all this. Fox news has been pushing quite a bit on ‘left bad, right good’ following the shooting of Republican House Whip Steve Scalise by a Bernie Sanders supporter. Levels of rhetoric, division and violence look likely to continue unabated, despite what should have been a wake up call for politicians on both sides of the chasm.